You have a dream. It could be anything. But let’s say that dream is a new home or place of business. Rather than buy an existing building, you want to create your own from the ground up. You’ve discussed plans with architects and contractors, maybe even gone over blueprints. Now, it’s time to make that vision come to life. But before you can do that, you need to excavate the worksite. It’s not the most exciting part of the process, but it’s one of the most important. And that means you need to hire an expert excavation contractor to handle the job. If you live in Toronto, consider calling Integrity Contracting Corp.
Meticulous Preparation – Performing an excavation starts with careful planning. We start by surveying the land plot to determine the grade and firmness of the soil. Using leveling and compacting equipment, our crews can make any necessary changes to the soil, ensuring that the home will be built on firm foundations. Versatility – With a broad variety of equipment and excellent technicians, there are no limits to what we can do. Our crews perform excavations for a variety of purposes: residential, commercial, swimming pools, playgrounds, etc. We also carry out the process from beginning to end, starting with planning and preparation, then trenching, leveling and compacting, and finally backfilling after the foundation has been put in. Heavy-Duty Equipment – Excavation is a big, dirty job that requires a full spectrum of mechanical equipment, both small and large. Here are a few pieces of equipment our crews use: trenchers, compactors, front-loaders, bulldozers, backhoes and dump trucks. Even more important than the quality of our equipment is the quality of our employees. Our project managers are fully qualified and all of our heavy equipment operators are properly trained. Your project is in good hands with us! Fully Licensed and Certified – Before you choose a company to handle your next excavation project, you should check their credentials. At Integrity Contracting Corp, we do great work and have the references to prove it. Fully licensed and insured in compliance with all Ontario laws, we are also members of the following professional associations: BILD Building Industry and Land Development Association, Construction Safety Association of Ontario and the Better Business Bureau, just to name a few. Warranty – We’ve built a stellar reputation around Toronto for a reason. But in the event that you aren’t fully satisfied with the work performed, we provide a warranty on all services good for two years. Give us a call, and we’ll come out and fix the problem promptly and at no additional charge. 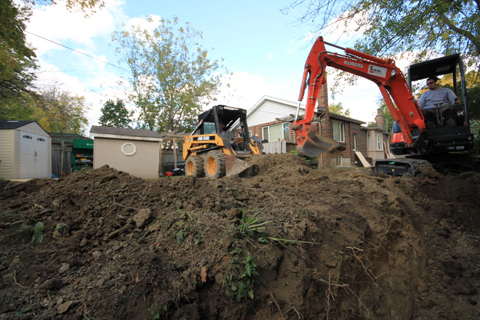 Are you ready to hire Excavation Contractors Toronto for your next building project? Give Integrity Contracting Corp a call today at 647-738-4395. We have a plan for your project! Visit us on Google+.